Elizabeth Gaskell 's biography of Charlotte Bronte was published by Smith, Elder & Co., in 1857 with two engravings, one of Charlotte's portrait by George Richmond and one of Haworth Church & Parsonage. 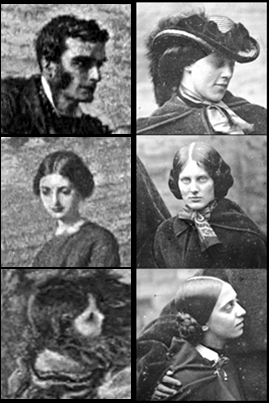 These were the first two images connected with the Bronte sisters that the general public had seen. The next Bronte-related image to be created came six years later in the form of an illustration for Jane Eyre. There are several similarities between the photo, which dates to about 1857, and the illustration of 1863. The watercolour has at least three influences; the novel, a wall in Sutton, Surrey and an earlier attempt by another artist at an illustration. The setting is the Garden Scene in the novel where Rochester is seated but Jane remains standing. The brick wall in the background still exists in Church Lane, Beddington, near the artist's home. Jane is probably looking at Pilot the dog because a copy of an earlier (unpublished) illustration existed; this was seen by Charlotte in 1853 and the original would have been at the office of Smith, Elder & Co. The photograph may have been a fourth influence. In both the photo and the watercolour the setting is a garden with a brick wall in the background and two vertical piers or buttresses. In the photograph, Emily is seated sideways on, looking towards Charlotte (author of Jane Eyre) who is holding a straw hat and Anne is in profile. In the watercolour, Rochester is seated sideways on, looking towards Jane Eyre who is holding a straw hat. Like Anne, Adele is seen in profile but at a 90 degree angle. The heads of the characters in the painting turned to the same angle as those in the photo. Walker appears to have created the characters in his painting of 1863 by transforming the figures in the photograph of c1857. He preferred to paint from the life but sometimes used photographs. The three heads in the painting are similarly positioned. Some details are more evident in the original watercolour which can be viewed or downloaded on Wikigallery. One example is the shadow cast by Emily's hat in the photo and the one present in Rochester's profile, even though the light is coming from a different angle. If the three figures in the watercolour are derived from those seen in the photograph then it is probable that John Stewart took the photo on glass (the negative) home to France, where he had the facilities to make a paper print, and sent it to George Smith in London. This would account for the handwriting “Londres - les sœurs Brontë” on the reverse. Stewart may have had hundreds of negatives stored away, presumably labelled, including the known photos of his daughter, brother-in-law (Sir John Herschel) and topographical views of Hawkhurst, Kent, but mostly views of the Pyrenees. For most commercial photographers in the 1850s the finished photograph was on glass and in a frame with an ornamental metal mat but for John Stewart the photo on glass was just a negative and the finished photograph was a paper print. This illustration was never used. In 1860 George Smith launched the Cornhill Magazine with William Thackeray as editor and twelve months later a young artist, Frederick Walker, began providing some of the illustrations. Two years later Smith and Walker were on "intimate terms." Walker read Jane Eyre whilst staying with George Smith at his country residence and suggested illustrating the novel. Smith commissioned him to illustrate a scene of his choice from it. The first illustrated edition of Jane Eyre was published in 1872 with artwork by Edmund Morison Wimperis. Walker's watercolour was exhibited in the 1860s but, at the suggestion of George Smith, the title was changed from Rochester & Jane Eyre to The Garden Scene. It does not appear to have been used as an illustration until the Haworth Edition of Jane Eyre in 1898. The original watercolour can be viewed or downloaded at wikigallery. Publisher: London, Duckworth & Co.; New York, E.P. Dutton & Co.